VoIP Outlook integration allows you to dial from Outlook. 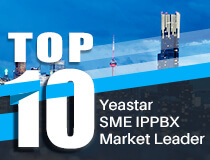 By connecting Yeastar S-Series VoIP PBX and Microsoft Outlook, you can easily make calls from Outlook via the PBX's trunk. This article explains how to connect Outlook with Yeastar PBX and click to call Outlook contacts. Download and install xtelsio TAPI. Step 1. Start xtelsio TAPI, click "Configure". Step 2. Choose a TAPI line and click "Settings". Step 3. Configure the TAPI line. In the "Asterisk Server" dialog, enter the access parameters of Asterisk Manager Interface. Note: The username and password must be the same with Yeastar AMI settings. Step 4. Click “Connect”, then click "OK" to check the state. IF the State shows "Connected and Logged in", the TAPI is successfully connected to Yeastar IPPBX. Step 5. Configure Asterisk TAPI device. Take one of Yeastar IPPBX extensions, and fill in the extension details in the Asterisk TAPI Device section. Below we take extension 1002 to configure. Your phone number: this is used as "Caller ID" and optionally for call detection. Step 6. Click "Ok" to save the changes. Step 1. Restart your Outlook. Step 2. Choose one of your Outlook contacts, view the details. On the CONTACT tab, click "More", and select "Call". Step 3. Click on dialog button "Dialing Options...". Step 4. Select the configured TAPI line in the pull-down list in the section "Connect using line". Step 6. Click "Start Call" to call the selected contact.